A governor has been found out to be in possession of a part of the N19billion illegally deducted from the Paris Club refund by the Nigeria Governors Forum. A report by The Nation has shown that detectives have traced $3million of the controversial London-Paris Club loan refund to a governor. The cash is believed to be part of the N19billion illegally deducted from the refund by the Nigeria Governors Forum (NGF), according to Economic and Financial Crimes Commission (EFCC) sources. The cash has been found in the account of a member of the House of Representatives who got it through a proxy, the lawmaker’s brother. Both were not available for comments. According to The Nation, the $3million is being spent on building a 100-room hotel in Lagos, which the governor may forfeit to the Federal Government. Also, the EFCC has placed a restriction on N8billion and $80million in the naira and dollar accounts of the NGF. The Presidency has released N1. 266.44trillion to the 36 states in the past one year. 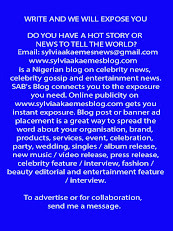 The cash includes N713.70billion special intervention funds to states. Following protests by states against over deduction for external debt service between 1995 and 2002, President Muhammadu Buhari had approved the release of N522.74 billion (first tranche) to states as refund pending reconciliation of records. 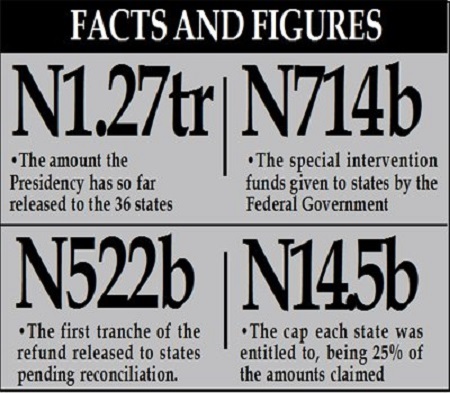 Each state was entitled to a cap of N14.5 billion being 25% of the amounts claimed. Finance Minister Mrs. Kemi Adeosun said the payment would enable states to offset outstanding salaries and pension which had been “causing considerable hardship”. The governors sought for the refund to states and local governments at a meeting with President Buhari on May 24, last year. A source, who spoke in confidence with our correspondent, said: “The EFCC is still investigating the N19billion allegedly diverted from the loan refund. The commission has so far interrogated 15 companies, more than 10 individuals and over eight bureaux de change used to divert the cash. “The latest bend of the investigation is the discovery of $3million linked with another governor who benefited from the illegal deduction. The governor had engaged a member of the House of Representatives(who was also a former commissioner) to launder his share. ”The lawmaker was said to have wired the $3million into his brother’s account before moving it into his own. “Upon interrogation, one of the suspects admitted that the cash was for the ongoing construction of a 100-room hotel for the governor. “About $500,000 of the $3million has been recovered by the EFCC. It is a scam in which many people benefited and a sizeable number of proxies used to launder the funds,” the source said. The $3million was transferred to the lawmaker for the governor from the $86million in the NGF’s domiciliary account. “We will do our best to recover the already diverted part of the $3million. We may also apply for the forfeiture of the hotel to the Federal Government,” the source said, pleading not to be named so as not to jeopardise the investigation. The $86million is said to be for the payment of consultants who worked for the refund for the 35 states. But none of the consultants has been paid. Some of them have already gone to court. The source added: “The EFCC has placed a Post No Debit restriction on the NGF’s account with N8billion and domiciliary account with $80million. “Out of the $86million, $3million was wired to the governor through a proxy and another $2million shared out. “The EFCC is ready to lift the restriction on the two accounts of the NGF on a condition that the consultants and legal advisers who deserve to be paid will be given what they are entitled to in line with the agreement signed with the NGF. The EFCC had earlier traced about N500million, which was meant for a consultant, to the account of a governor. The cash has been retrieved.